So what does one do when one has a cold and can't do much of anything? 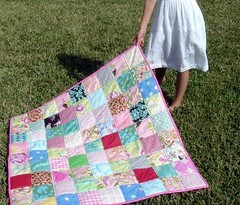 So here's the first, a baby/toddler/lap quilt of pretty Amy Butler, Heather Bailey, etc. 5" squares. The backside is soft orange and the binding is a bright pink floral. 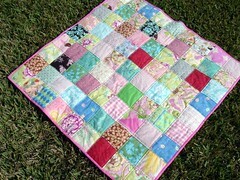 I love the cheeriness of this quilt. It's so colorful and happy. 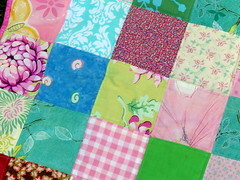 There is some repetition of fabrics, but not much ... really, there's a lot of different pieces in this little quilt. The quilt measures about 40" square. 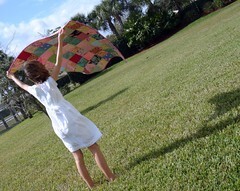 The quilt is available on etsy and it'll also be available at Ditto Kiddo. I'm not sure what's up with the camera today, the pictures seemed to come out awfully fuzzy, unusual for pictures taken outdoors. I guess I need to go back and read the manual again. I'm getting so frustrated with this camera, it's not a bad camera but I'm sure there are much better ones out there ... but I'm also sure there not in cheap. My model, M., was delightful and forgot about the camera really quickly. 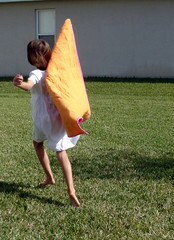 She was more interested in the wind and trying to fly away with the quilt as a glider. I think we're all on the mend and starting to feel better. There's a bit less sniffling going on and the kids have a lot more energy. I'm still stuffy and can't speak well, but I certainly feel better than I did yesterday. I've been asked, often, how C. is doing in school. As I mentioned earlier she started high school this year, her first year in a traditional school environment since first grade. Well ... she loves it. She's enjoyed the social aspects of it and loves the new friends she's making. I, on the other hand, don't love her being in school at all. The curriculum isn't challenging her at all and I'm not thrilled with some of her behavior since starting school. And I miss her. I love having her around and I enjoy seeing the closeness between all the kids, which has changed now that she's started school. I'd hoped we'd be able to pull her out at the end of the first semester, but after much talking and soul searching we've decided to keep her in school for the rest of the school year. She is, however, taking two online classes (economics and geometry) and must get involved in some academic groups at school. After this school year she'll be able to enroll in some community college classes and do more online classes, so she'll be more challenged and still have some opportunities to socialize in a school setting. That's the plan for today, at least.